Many people has know about dart piece. It is one of interesting game that come from America. You can play it indoor and outdoor. This game has no age limit, so all people and children can try it. Dart is also become a favorite game for adolescent. They usually play it at camp in their holiday activity. It’s really fun to play it at camp and garden. But have you imagine to use a dart as house decoration? A giant dart can realize it. You probably never imagined that there would be giant dart in your house. But we can make it for you and designed it in beautiful shape of giant dart. So you can put it in your living room or at outdoor area. Just like in the picture above, you can put it in your patio area. 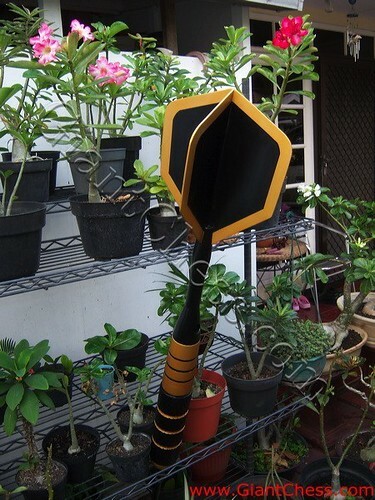 This giant dart is durable product for outdoor use because it has made from Teak wood, the strongest wood in the world. It easy to move and save. Try it and dress your patio with a Giant Dart.